A bug-fix update that adds support for macOS 10.14 was just pushed. Thanks again to all those early testers, and my sincerest apologizes to those of you who have been living in the Mojave betas, for as you clearly know, Espresso was unusable thanks to some nasty crashers. Also, please note that while this update fixes those critical issues, it does not yet add support for Mojave's Dark Mode. Don't worry, I'm currently working to make Espresso really shine there, but it is going to take a little more time. Thanks for your patience, and I hope you enjoy using Espresso in the Mojave betas! I heard a lot of you saying that the extra click required each time you wanted to see applied styles in the Xray panel was a real drag. I agree, and so it has been redesigned to expand (and stay that way) when an element is selected â€“ just like it did in Espresso 2. Xray also now shows all applied styles for the selected element while in the corresponding stylesheet. You can also quickly jump back to the preview window/tab via the "Back to Preview" button. For a complete list of additions, improvements and fixes, make sure to check out the release notes. Now in addition to buying a license directly, you can also get Espresso through Setapp! If you haven't heard of it already, Setapp is a subscription service ran by the team at MacPaw that gets you immediate access to a hand-picked set of great macOS apps like RapidWeaver, Ulysses, Paw and Expressions (just to name a few that might help with your web development). I'm really happy to be able to offer options when it comes to buying and using Espresso, and no matter which way you choose to go, you will be getting the exact same app! If you have any questions or concerns about either of these, please feel free to shoot me an email. That's all for now. Thanks for reading, and have a great Thursday! I have some exciting news to share today: Espresso (with CSSEdit inside) has changed paws from MacRabbit to Warewolf! But wait. Who am I, what is Warewolf and what does all this mean to you? Glad you asked! My name is Pete, and it's nice to meet you. 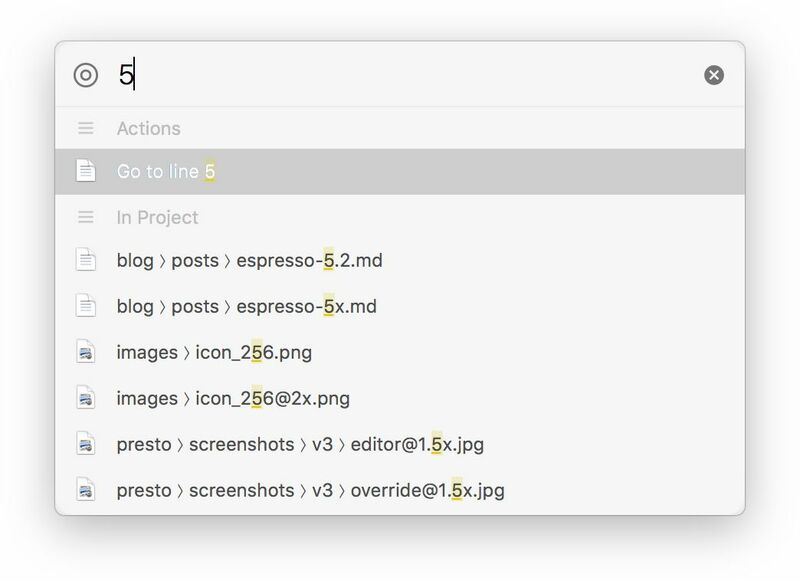 I'm a longtime Espresso/CSSEdit user and friend of Jan's, and I'm absolutely over the moon to carry the torch and keep a good thing like Espresso going (can you believe it has been around for almost 10 years)! I'm passionate about Apple platforms, beautifully crafted native software, the indie, view-source web and learning by doing. Away from the computer I'm a husband, a father and a lover of the wild! Warewolf is my Mac and iOS one-man shop (with some help from my wife and daughter). It is an independent business by choice and principle, and it's here for the long haul. Espresso is also our one and only app, which means it will be getting the attention it deserves. For years it has been a trusted companion in your dock (mine included) and I intend to keep it that way. And a lot of cool stuff is in the pipeline! Jan and I are still in the process of transitioning things, so stay tuned to this blog and Twitter for more updates. Also, I'm learning. Making great software is in my blood but all of this running-a-business business is new, so bear with me :) I look forward to sharing what I learn, and traveling this road together. Lastly, I'm really happy to be here. Please feel free to reach out to pete at espressoapp.com if you have questions, concerns, ideas, or just want to share a cool thing you've made! P.S. No rabbits or any other animals were harmed in this transition. Norbert still says hello. Updates and licenses are going back to the traditional model. For the new Espresso, we changed our versioning and licensing approach with more consistent pricing and a simpler development timeline: â€œX+1â€�. Each new update would increase its version number, users would decide which update was actually major to them and purchase upgrades accordingly. We're abandoning this system and going back to the traditional way of doing things: X.y.z updates where a new X means paid upgrade. Why? While the new features got overwhelmingly positive reactions, the response to the version and licensing approach was borderline feral. Espresso never switched to an expiring subscription model, but it was declared so nevertheless. We still believe traditional version numbers are mostly arbitrary instruments of marketing, but it's more productive to switch back. We want to make an app, not defend against opinions having little to do with our own approach. If anything, we've learned that developers might as well implement a restrictive subscription when you deviate from 30 year old practices â€” you're gonna get hate mail either way. Where does that leave things? Espresso will continue its life as 5.x, with the next minor update now in beta. Everyone who purchased so far will get exactly what we sold: a year of free, non-expiring updates. That probably means Espresso 6 is at least a year away (if not, we'll compensate some other way). Every new sale falls under the traditional system: free updates within the 5.x cycle, 6.x becoming a paid upgrade. TL;DR: not much changed for users, except that we can get back to spending more time on good improvements instead of epic email battles about imagined injustices. Say hello to the new Espresso, our biggest update ever. The Web is a big, beautiful mess. In this brand new iteration, Espresso becomes a big, beautiful app again. Our original internal mission statement was â€œCSSEdit for everythingâ€�. At some point, all the other things that go into making a web editor had us lose sight of the fact that this must start with being a fantastically useful styling tool. With Espresso v3, we think weâ€™re back on track. 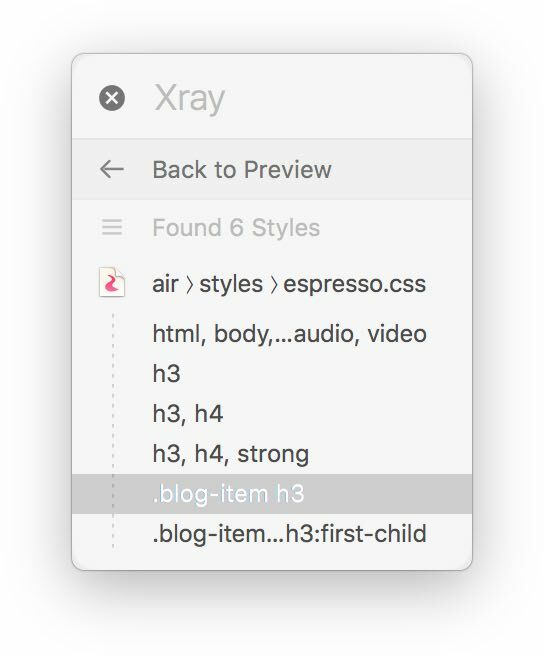 Live Preview with Browser Xray â€” See your projects update live as you edit and style, in Espresso or in Chrome, Firefox or Safari. Even Xray works inside other browsers. Additionally, thanks to the local HTTP workflow, page navigation and resource loading work exactly like they would when uploaded. Supercharged Live Styling with SCSS and LESS â€” With out-of-the-box SCSS+LESS editing support, complex style sheets are a first class experience. Add Overrides for live websites into the mix, and experience a new kind of styling productivity. Dynamo Auto-Build â€” Powering the new dynamic style sheets workflow is Dynamo, our brand new built-in build system. That's not all it does, though. As an in-app beta, use smart HTML and Markdown for modular components, amazingly integrated with Live Preview. Editor Improvements That Are Just Sublime â€” Re-Indent HTML, CSS and JS. Edit and delete multiple selections at once with Multi Edit. Indentation guides to make your code extra readable. Zen shortcuts with snippets integration, and toolbar favorites. Open Quickly. All on top of the great editor we already had. There's more in this radically re-engineered release. We hope you thoroughly enjoy it. When you try Espresso, a Welcome project will get you started with the new stuff. Let us know what you think!